​with interested partners and community members! While climate change is a global challenge, its impacts are experienced at the local level, and it falls to local communities to address them. We are already experiencing the impacts of climate change in Missoula County, and those impacts are projected to intensify over the coming decades and to touch every sector of our county. Changes are likely to include reduced low elevation snowpack, earlier spring snowmelt, more frequent and intense droughts and wildfires, and impacts to agriculture and recreation. The earlier that we understand and prepare for these changes, the greater our chances of mitigating their impacts on human health and safety, the natural environment, and our local economy. Missoula County, the City of Missoula, and Climate Smart Missoula are working together to lead a county-wide effort to better understand our greatest vulnerabilities in the face of climate change, and to develop a coordinated plan to prepare our county for the changes we are facing. 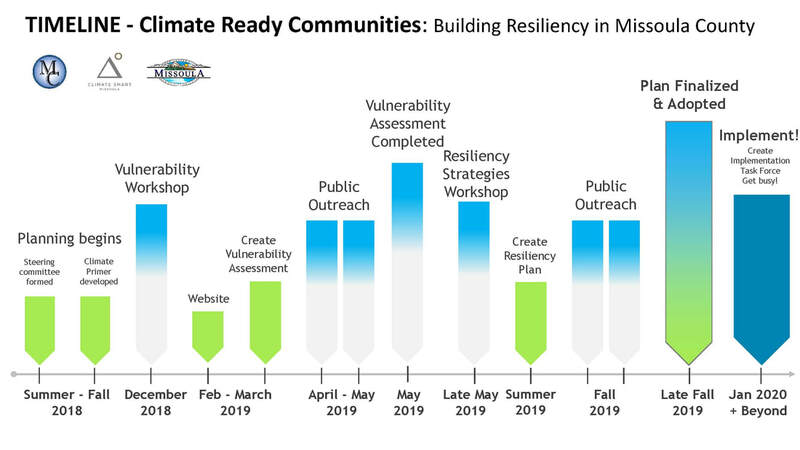 This climate resiliency planning process will unfold over the next 12 months and will generally follow the guidelines of the Climate Ready Communities program developed by the Geos Institute. It's important to note that this is not the first time that climate adaptation has been considered in Missoula County; indeed, numerous local efforts have addressed this topic either directly or indirectly. The goal of this process is to build from those efforts in a comprehensive and inclusive manner. We have created a primer to inform our resiliency planning efforts. Please download, read and share: ​Missoula County-Wide Climate and Community Primer Dec 2018. Our draft Vulnerability Assessment is coming soon - scroll down to learn more. Gwen Lankford Spencer, Sapphire Strategies, Inc.
What to expect moving forward? This spring we'll be seeking public input on a draft Vulnerability Assessment, which is being developed with input from a broad range of local stakeholders in fields including public health, emergency services, agriculture, forestry, wildlife, recreation, business, underrepresented communities, and local water, energy, and transportation systems. There will be a second opportunity for public input in the fall - see timeline above for details. If you would like to be on our list to be alerted when we are ready to share the Vulnerability Assessment and seek public comment, please sign up here. We'll send you an email!